President Donald Trump is preparing to tell the world whether he plans to follow through on his threat to pull out of the landmark nuclear accord with Iran and almost surely ensure its collapse. 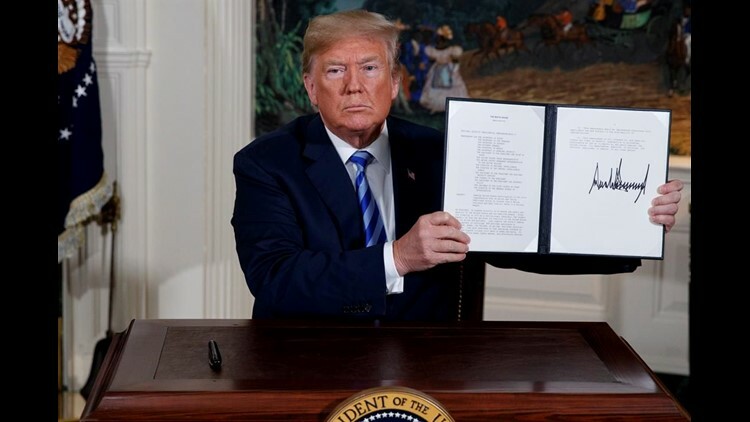 WASHINGTON (AP) — President Donald Trump withdrew the U.S. from the landmark nuclear accord with Iran on Tuesday, abruptly restoring harsh sanctions in the most consequential foreign policy action of his presidency. He declared he was making the world safer, but he also deepened his isolation on the world stage and revived doubts about American credibility. But Trump, a severe critic of the deal dating back to his presidential campaign, said in a televised address from the White House that it was "defective at its core." U.S. allies in Europe had tried to keep him in and lamented his move to abandon it. Iran's leader ominously warned his country might "start enriching uranium more than before." Laying out his case, Trump contended, "If we do nothing, we know exactly what will happen. In just a short period of time, the world's leading state sponsor of terror will be on the cusp of acquiring the world's most dangerous weapons." Trump spoke with French President Macron and Chinese leader Xi Jinping about his decision Tuesday. Hours before the announcement, European countries met in Brussels with Iran's deputy foreign minister for political affairs, Abbas Araghchi.